Finalizing the details of a multi-billion dollar buy-out from Alaska Airlines, Burlingame-based Virgin America may vacate the company's Peninsula office and put it on the market, according to reports. Roughly 225 Bay Area staff members from Virgin America have already been notified that they will be let go, but an official decision regarding the future of 85,000-square-foot office space at 555 Airport Blvd. in Burlingame remains up in the air, The Registry reports. The five-story building's lease expires in 2017. Virgin America will have to notify the landlord 120 days before that date with its detailed plans regarding the company's status in that space, according to The Registry. Virgin America offered a statement regarding its future Tuesday. "Following the closing, Virgin America will continue operating as a subsidiary of Alaska Air Group at our current location, 555 Airport Blvd. in Burlingame," spokesperson Dave Arnold said. "Our current lease doesn't end for another year, and while no long term office space decision has been made at this time, there is no question that Virgin America will continue to have a significant presence in the Bay Area." 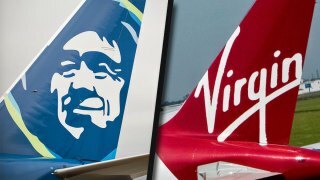 Alaska cliched its acquisition of Virgin America, which is the sixth-largest national carrier by traffic, in April for more than $2 billion.